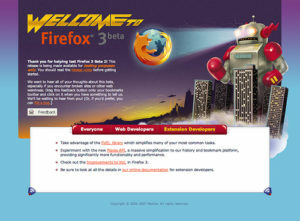 Goal: Create a first run page for the latest Firefox 3 beta that would be eye-catching enough to make people stop and explore ways they can provide feedback. Solution: A giant robot, of course. Your Challenge: Answer the unanswered questions…who is behind this rampaging robot? Are the UFO’s in the background working with or against it? What’s the significance of it all? Post your theories in the comments section – the best one gets a Firefox t-shirt. Thanks to Nobox for getting in touch with their inner sci-fi geeks and creating the very cool art for this page. The informal contest is now over (details here)…thanks to everyone who submitted their theories. I’ve been really blown away by all your ideas!